Middle English, from Old French past participle of referer (“to relate, to refer”), from Latin referre (“to carry back, to report, to notify”); as if refer +‎ -ee, that is, the person to whom something is referred for consideration. 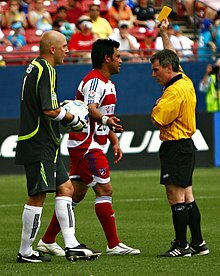 An association football referee (right) issues a yellow card to a player. (sports) An umpire or judge; the official who makes sure the rules are followed during a game. The referee kicked Jim out of the game for fighting. A person who settles a dispute. A person who writes a letter of reference or provides a reference by phone call for someone. Your application, along with letters from three referees, should be received by January 31. An expert who judges the manuscript of an article or book to decide if it should be published. In general, a referee moves around with the game, while an umpire stays (approximately) in one place. To act as a referee. He has to referee three hockey games this weekend. She has to finish refereeing an article for Nature. This page was last edited on 14 March 2019, at 14:43.